The controversial threat from Iran to send two satellites into orbit was unsuccessful as reported today when the attempt to launch the Payam satellite, was thwarted when the rocket failed to reach orbit. 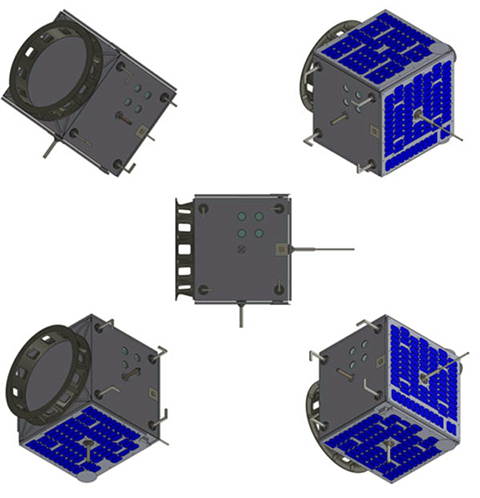 Illustration of Iran's Payam satellite. Iran’s president, Hassan Rouhani, had introduced Iran's plans to launch two satellites known as ‘‘Friendship’’ and ‘‘Message,’’ which allegedly will be used to observe climate, agriculture, water and forestry points within the nation. Iran had ignored warnings from the U.S. about Tehran's rocket tests and accusations they would be violating United Nations resolutions. This was further validated by U.S. Secretary of State Mike Pompeo who has said that Iran's plans demonstrate the country's defiance of a U.N. Security Council resolution. The U.S. and its allies allege the same satellite-launching technology could be used to develop long-range missiles capable of carrying nuclear weapons. Israel's Prime Minister Benjamin Netanyahu said on Tuesday that the Iranian satellite launch, which Tehran said has failed, was actually part of the country's attempt to develop intercontinental ballistic missile. Netanyahu criticized Iran for lying regarding its failed attempt, claiming in an address delivered on Tuesday morning that Tehran was not saying the truth and that the satellite launch was the first stage in its effort to launch an intercontinental ballistic missile. He said, "Iran is launching an innocent satellite, but is actually interested in reaching the first stage of an intercontinental ballistic missile, violating agreements." That resolution calls on Iran to undertake no activity related to ballistic missiles capable of delivering nuclear weapons. Iran insists the launches do not violate the resolution. News of the failure came from Iran's Telecommunications Minister Mohammad Javad Azari Jahromi who told state TV that the rocket carrying the Payam satellite failed to reach the "necessary speed" in the third stage of launch. He didn't offer information about what caused the failure, but stated that scientists would continue their research. “I might have favored to make you proud of some excellent news, however generally life doesn’t go as anticipated,” Iran’s minister of telecommunications, Mohammad Javad Azari Jahromi, said in a Twitter post. He stated the rocket, a Safir, lengthy used for satellite tv for pc launches, had failed within the remaining stage, falling in need of inserting its payload into the proper orbit. He didn’t provide any rationalization. Over the past decade, Iran has sent several short-lived satellites into orbit including launching a monkey into space in 2013. On January 1, Iran said the nation had plans to send Payam, a 200-pound (90-kilogram) non-military satellite, into a 310-mile (500-kilometer) orbit using an Iranian Simorgh satellite-carrier rocket. Iran insists the launches do not violate the resolution. America, Israel and a few European nations have criticized Iranian missile checks up to now, saying the launches pose a risk to the area. One of many causes President Trump gave for withdrawing from the 2015 nuclear deal was its failure to deal with the specter of Iran’s ballistic missiles. Tehran is conducting its final preparations before launching a satellite into orbit from its Imam Khomenei Spaceport in northern Iran, an Israeli satellite imagery firm said Monday, citing new photographic evidence of the area. Earlier this month, Iranian President Hassan Rouhani announced that Iran would be launching two satellites into space “using our domestically-made rockets” within the coming weeks. Israel and the United States, among others, are concerned that Iran is using its space program to further develop its ballistic missile program. 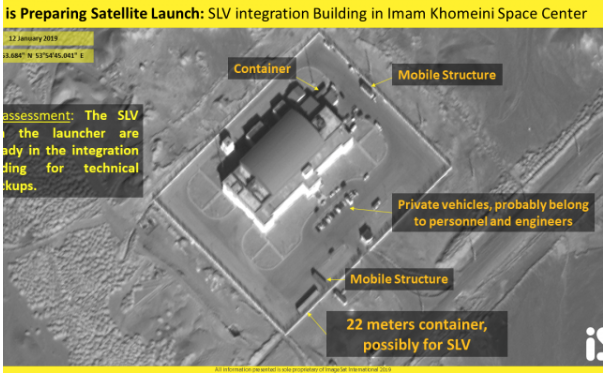 According to the Israeli satellite imagery analysis firm, ImageSat International, this appears to be imminent, as large numbers of personnel have arrived at the Khomenei Spaceport in recent days, and the launch site has been prepared for use. “ISI satellite imagery reveals that the launch preparation process is in its final stages,” the firm said. Images provided by the company show trucks and private vehicles around the spaceport. “It is our assessment that the missile that will carry the satellite is already in a construction site, and that checks are being preformed on it and on the launcher,” ImageSat said. ImageSat offered no information about the second satellite that Iran says it plans to launch in the near future. Previously, Iran has sent several short-lived satellites into orbit over the past decade, and, in 2013, launched a monkey into space. The US and its allies worry the same satellite-launching technology could be used to develop long-range missiles. Last week, Iran said that the country’s three new satellites have successfully passed pre-launch tests. Earlier in January, US Secretary of State Mike Pompeo said Iran’s plans for sending satellites into orbit demonstrate the country’s defiance of a UN Security Council resolution that calls on Iran to undertake no activity related to ballistic missiles capable of delivering nuclear weapons. Pompeo is currently touring the Mideast to promote the White House’s tough stance on Iran, and to assure America’s Arab allies that the Trump administration is not walking away from the region. On Wednesday, Iran’s supreme leader, Ayatollah Ali Khamenei, called Washington officials “first-class idiots,” in unusually harsh remarks that reflect the broader tension between Iran and the US after President Donald Trump withdrew America from Tehran’s nuclear deal with world powers.